See Background Skin Requirements tab for detailed specs. See Pencil Ad Requirements tab for detailed specs. proper macro placement instructions and/or are from a DFP-Certified Vendor. files, media and any other files which contribute to the ad display, zipped. Click here for full ad tech specs. Must be the same color on all eight creatives. Must not contain any lettering, buttons, multi-color background, or pictures. does not need to be red in this area. the top 35px not being visible due to the NBA Chrome overlap. 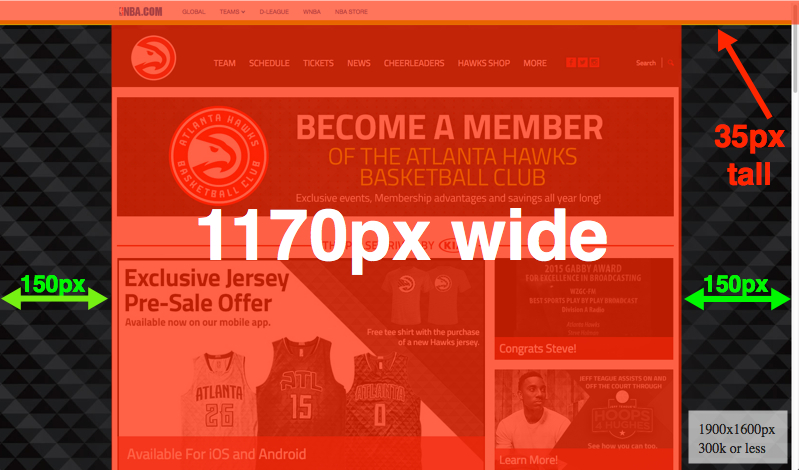 (including the header/navigation) is 1170px wide. on the device being viewed on and the width of the browser window).